Ocean scientists are objecting to the closing of the Kewalo Marine Laboratory. Here, marine researchers Elaine Seaver, left, Mark Martindale and William Browne and UH zoology graduate student Kevin Pang pose with a collecting tank. University of Hawaii marine scientists object to the elimination of one of Hawaii's two marine laboratories, particularly when concerns are accelerating about the world's oceans. "Closing a productive marine laboratory in Hawaii is simply ill-advised by all rational measures," Mark Martindale, Kewalo Marine Laboratory director and noted specialist in evolutionary developmental biology, said in a statement on behalf of the 40 to 50 faculty, students and staff. UH has agreed to swap its Kewalo Marine Laboratory in the Pacific Biosciences Research Center in part for a site next to the medical school in Kakaako for a new Cancer Research Center. The waterfront laboratory on Ahui Street, which has 22 years left on its lease, would be returned to the Hawaii Community Development Authority in five years. "We agreed to be responsible for any demolition and clearing work, as well as reasonable assistance in terms of relocating those research (programs)," said HCDA Executive Director Anthony Ching. "The university should not have to sacrifice a productive research unit, and one of only two modern and well-equipped marine laboratories in the state, to justify the expansion of the Cancer Research Center of Hawaii," the Kewalo group said in the statement. "That valuable unit should be expanded on its own merits." But Gary Ostrander, vice chancellor for research and graduate education and interim director of the Pacific Biosciences Research Center, said: "We basically can't afford to keep two labs up and running on the ocean." He said he doesn't know of any other university with two marine laboratories within 15 miles. The Hawaii Institute of Marine Biology on Coconut Island is UH's other marine lab. The Kewalo lab also needs repairs and the university still has people working at home because of costs of repairing the laboratory school that burned down in 2006, Ostrander said. 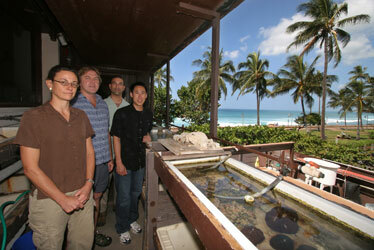 The Kewalo scientists said that Florida, also an ocean state, has 22 marine labs. "Even Georgia would have more marine labs (four) than Hawaii" if the Kewalo facility goes, said Michael Hadfield, biosciences research center faculty member and former director. Closing the lab "would put us at the bottom of the pile, and here we say we're a major marine state, one of only two states in the country to work on coral reef biology," Hadfield said. He said the laboratory was founded to use Hawaiian marine organisms to carry out fundamental research in cellular, molecular and developmental biology, with significant discoveries appearing in such prestigious journals as Science and Nature. Kewalo faculty members said Ostrander told them three years ago the laboratory lease would not be given up until an adequate facility was built for them with access to seawater. The Coconut Island laboratory is already overcrowded and the only space available for them is on the Manoa campus, without access to the seawater essential for their research, the scientists said. They have about $6 million in grants that would have to be sacrificed if they have to relocate without access to fresh seawater, they said. Ching offered some hope for a solution. He said he is "exploring something that holds some promise" within the five-year time frame that might accommodate the laboratory, as well as other agencies in the area. "We would look to maintain that (pipeline) access for them."